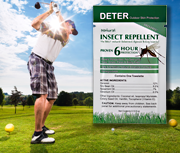 Deter Outdoor Skin Protection is providing over 1,000 individually packaged towelettes containing Deter Insect Repellent®, a scientifically proven natural insect repellent, to participants of the 2018 US Open Golf Tournament. Deter Outdoor Skin Protection is providing Deter Insect Repellent® for the 118th U.S. Open Golf Tournament taking place at Shinnecock Hills Golf Course from June 11 through June 17, 2018. This is the 7th year in a row organizers have asked the Company to provide insect repellent for the tournament. The company is furnishing over 1,000 individually packaged wipes containing natural Deter Insect Repellent® to participants, organizers and sponsors. Deter Insect Repellent® has been proven by independent laboratory testing to effectively repel biting insects for over 6 hours. Deter Insect Repellent® has been well received in the golfing community. It offers effective natural protection for golfers looking for a safe alternative to DEET that will not damage golf equipment. The individually packaged towelettes are convenient to carry in golf bags or pockets. In addition to golf, Deter Insect Repellent® is safe and effective for all outdoor activities, including hiking, cycling, boating, camping, backpacking and fishing. Deter Insect Repellent’s unique formula was scientifically developed by a professional chemist to ensure safe long term repellency against a wide range of biting insects. Tested in the laboratory and in extreme outdoor conditions it provides ultimate outdoor protection against mosquitoes, ticks, chiggers, no-see-ums, biting flies and gnats. Deter contains a proprietary blend of 8 plant oils and plant derivatives that work together to provide enhanced repellency for an extended period of time. All ingredients in Deter Insect Repellent® are Generally Recognized As Safe (GRAS), and comply with EPA regulations as a minimal risk insecticide. Deter is biodegradable and environmentally safe. It does not contain any DEET, the active ingredient in many insect repellent products which research has shown presents health and environmental risks. Deter Insect Repellent® is a product of Mariner Biomedical, and is a member of the Deter Outdoor Skin Protection line. It is an effective DEET-free, natural insect repellent developed through scientific research. Deter Insect Repellent® is clinically tested safe, Dermatologist approved and proven effective by an independent laboratory. Deter Insect Repellent® repels mosquitoes, ticks, no-see-ums, biting flies and gnats for over 6 hours. Mariner Biomedical, Inc. is a bio-pharmaceutical company dedicated to developing topical skin care therapies based on scientifically validated natural and marine ingredients which are safe, effective and environmentally friendly. The Mariner Biomedical research laboratory and corporate offices are located in San Jose, CA. Mariner Biomedical has a management and research team with over 50 years of pharmaceutical, biotechnology and clinical research experience.